Dwarves have been a source of inspiration for many tales, legends, myths, epic fantasy writers, and game creators. Writers such as JRR Tolkien popularized this fictional race and made them a part of the contemporary culture. However, dwarves were also very popular as being a part of fairy tales such as Snowwhite where the stereotype of them working in a mine was explored. Yggdrasil decided to pay tribute to these magnificent fictional race and their vigorous spirit and hard-working ethics. Just like in Tolkien’s novels and in Snowhite, dwarves are professional mine workers who dig to find riches hidden deep beneath the surface of the planet. In fact, Dwarf Mine offers a unique experience that players have never seen before, with amazing graphics and smooth, breathtaking animations. The player basically assumes the role of a dwarf miner going underground to find valuable materials and precious stones. The hard-working hero will face many challenges but will be rewarded for them if he is lucky enough. Yggdrasil is one of the most popular online slot development companies and it is a subsidiary of the popular casino operator from Sweden, Cherry AB. 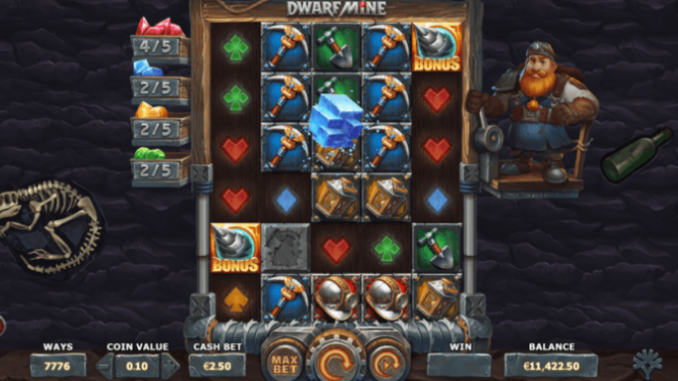 They issued an official press release about the game on Thursday, declaring that Dwarf Mine is a mobile-friendly online slot game which features a lot of interesting features, including a “hard-working hero,” which is a dwarf that assists players in their quest to explore the hidden riches of a mine. Furthermore, the company officials said that the game was built with the state-of-the-art HTML5-friendly technology based on iSesne 2.0+ framework. They added that the game challenges online slot enthusiasts and professionals to dig deeper into the mine and discover hidden treasures that could bring potential big wins for the luckiest ones. According to Jonas Strandman, Senior Product Strategist for Yggdrasil Gaming, the game will feature an interesting bonus symbol which will have a shape of a drill commonly used in mines. This drill has the power to expand reels and reveal more icons, thus increasing your chances to win hefty rewards as you spin the reels. Furthermore, this symbol has a scatter symbol function which will activate the free spins bonus if you manage to land three of them during one spin. Strandman stated that they were especially proud of how they had managed to make a unique gameplay experience with mechanics and visuals perfectly aligned with each other. The synergy between the two can help players win up to 1,000 their bet size from a single spin. Furthermore, Strandman added that they were sure that they had made the game that would become popular with both casual players and slot experts. This is definitely a great game, but then again – Yggdrasil hasn’t had a bad online slot game for a very long time. In fact, all their games seem to be hitting the right target audience, with each title being immensely popular in the online slot community.